Can you tell us a little about your business and how you came to run it? 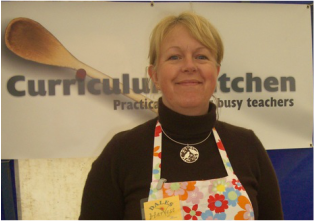 My business is called Curriculum Kitchen. For the past 10 years, I've been delivering historical and wild food workshops in schools and museums in Yorkshire. I also do historical food talks, often with costumes relating to the food era and work with independent groups interested in a food day. Inspired by the lush beauty of Swaledale, I wanted to share my interest in the heritage of the people who have lived here over the last 3,000 years. I wanted to do something that provoked a reaction - and whether food is nice or nasty, it always gets people talking and interacting! Originally I had children at school and it fitted in with school times, but as they have grown I now travel much further afield, often taking the ‘eat local, grow your own’ message into urban deprived schools. Encouraging children to cook meals from cheap, fresh and local ingredients is very rewarding and I hope teaches them a life long skill. After years of being embarrassed about my job, my youngest, who is away in London at Uni is very enthusiastic about spreading the message too. Perhaps she just needed to be away from this glorious place to appreciate it! There is no place in the world that is better to return to than Upper Swaledale. It doesn’t matter if it has been a day at work or exotic holiday, the weather and light on the landscape is always different. The people of the Dales are part of its charm. I have never lived in a friendlier place and never take for granted how lucky I am to live here. I really enjoy encouraging people to learn from the past, to think about how food was cooked, stored and eaten, or teaching them something simple that they didn’t know before. Sometimes it's as simple as a local weather or folk lore saying, or a quick easy long forgotten supper from the past. Walk through the wild flower hay meadows from Muker, surrounded by the hills and birdsong, perhaps finishing with an afternoon tea in Muker or Gunnerside. If a visitor was coming here for two days (or more! ), what would you recommend they should try to do? Any particular places to eat or drink you'd like to recommend? Visit Reeth for an ice cream from Cuckoo Hill View Parlour, a cake and the best coffee for miles at the Dales Bike Centre in Fremington. Where in the Dales do you feel sudden swooping joy? I love driving into Swaledale across Buttertubs Pass, whatever the weather! It is so uplifting! I also feel happy looking at the view into Arkengarthdale as you drop down from the Stang. It makes me marvel at its harsh industrial heritage and the human ability to live in such a wild place. What happy detail in every day life do you particularly enjoy? Being surrounded by industrious wildlife and birdsong. I love to walk up to the top of Fremmington Edge and just sit and watch the convergence of Swaledale and Arkengarthdale. Reeth is a perfect spot for a tiny town – no wonder the Roman and Vikings settled here! I try to always take time to just be still. Even in just a few moments you can see or hear nature getting on with stuff! How do you answer this diplomatically?! I so enjoy all of the older generation that go to Low Row and Muker Luncheon Clubs (I'm a volunteer server/washer-upper). Most have lived in the Dale all their lives and seem completely unflappable and secure with Dales life and their place/role in it. I always admired Ann Holubecki who was a stalwart in the Friends of the Dales Countryside Museum and really enjoy the company of Eleanor Scar from Wensleydale. Her interest in Dales life of the past meshes completely with her enthusiasm for the future. Arkengarthdale Sports (1st Saturday in June) does the absolute best afternoon tea in the land. An absolute must do day for our family, I love that it hasn't changed since I was a child. It perfectly embodies traditional Dales afternoon of fun and socialising!